Peltz Ga llery. Birkbeck School of Arts. 8th November – 13th December 2017. Gallery opening times: Monday-Friday 10am-8pm, Saturday 10am-5pm. Closed on Sundays. Free entry. See gallery location on a map. How can something that doesn’t happen have a history? How can there be a material trace of un-pregnancy in the archive? This exhibition explores this paradox, finding and reimagining a material history of pregnancy feigned, imagined, hidden and difficult to diagnose. Whilst reproductive medicine is at the front of scientific modernity, biomedical technology has no jurisdiction over the experiences of waiting, unknowing and disappointment. 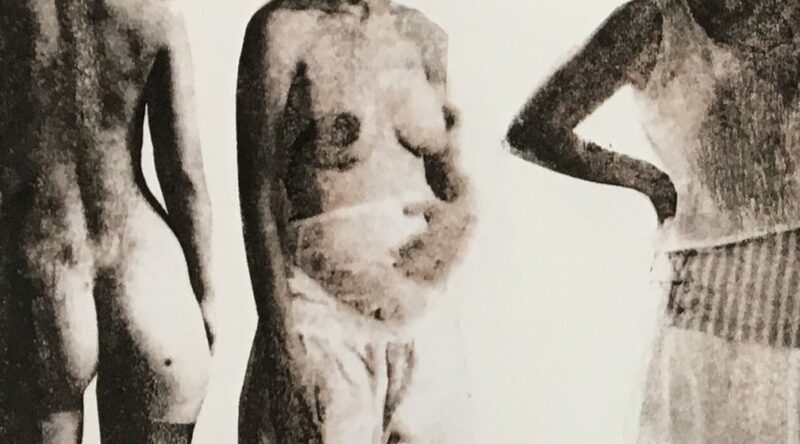 Conceiving Histories is a collaboration between literary historian, Isabel Davis, and visual artist, Anna Burel, producing creative and fictional reworkings of the archival materials of un-pregnancy. This exhibition re-materialises the past, giving structure and shape to things that have been left to us in text. The artworks explore the search for knowledge about a reproductive body which is as opaque as history: resistant, mediated and contested. They reflect on the signs of pregnancy in, from and on the body, and on messages and messengers, divine or earthly. Empty uterine spaces are imagined here displaced from the corporeal frame, labelled and dated, filled with strange visions. Swollen and flat structures, pads and envelopes, hollow and filled, contrast the fantasies of or desire for pregnancy with the reality of the un-pregnant body. 15th November 2017- Private viewing and reception 6-8:30pm. Reserve your free place. All Welcome! Free event: Behind the Exhibition public talk. 22nd November 2017. 6-8pm. Part of the Being Human Festival Programme. Book your free place here. Academic and Artist symposium. 30th November-1st December 2017. Book a place here. This exhibition has been generously supported by the Peltz Gallery, the Centre for Medical Humanities at Birkbeck and, through a kickstarter campaign, the following generous individual donors: Neelesh Prabhu; Matthias Schiller; Henry Singer; Jutta Rolf; Familie Rolf; Rémy Burel; Isolde Hahn-Pfaff; David Burel. The research behind the exhibition was funded by the Wellcome Trust and Birkbeck, University of London. Missed us at Fertility Fest?